Diabetes is particularly harmful to seniors since it can cause extensive nerve and organ damage if left untreated. Diabetic seniors should monitor their blood sugar regularly and pay close attention to their diet. Food for diabetic seniors needs to be rich in nutrients while being low in sugar. Take a look at some of the beneficial and harmful foods for seniors with diabetes. Whenever possible, it is a good idea for seniors with diabetes to eat dishes made from fresh vegetables. Vegetables with a lot of color, like tomatoes, beets, carrots, and kale, tend to have particularly high nutritional content. For many older adults, weight loss is an important part of reducing the symptoms of diabetes. Fresh vegetables are high in fiber and low in calories, so they can keep your senior loved one feeling full for hours without packing on the pounds. It can be difficult preparing food for diabetic seniors, but a professional caregiver can help your loved one maintain a nutritious diet. Oshkosh non-medical home care experts are available to provide high-quality care to seniors on an as-needed basis. From assistance with mobility and exercise to providing transportation to the doctor’s office and social events, there are a variety of ways professional caregivers can help your aging loved one continue to live independently. White bread, premade cookies, flour tortillas, pastries, and crackers all tend to have a lot of added sugar. Since these foods are so low in nutrition, they only provide empty calories without many nutrients. In addition to being loaded with sugar, these sorts of processed starchy foods are particularly problematic because most of the fiber has been removed from them. The body processes them too quickly, causing dangerous blood sugar spikes. The healthiest types of proteins for older adults with diabetes are typically plant-based proteins like tofu, nuts, seeds, and beans. These foods contain enough protein to make your loved one feel energetic and active, but they are also very low in fat and sugar. Diabetics who want animal-based protein should typically stick to seafood and low-fat poultry so they can keep their weight low while receiving plenty of nourishment. Excessive fat intake can exacerbate diabetes symptoms, so you may need to trim fat off the chicken and other meat your loved one eats. Without any food or fiber content to slow digestion, the sugar from juices enters the bloodstream rapidly. Seniors with diabetes need to cut back on sweetened coffee, sweet tea, soda, and energy drinks. Even fruit juices or fruit-based smoothies could cause a rapid increase in blood sugar. Sugary alcoholic beverages like frozen margaritas are a particularly bad choice because alcohol causes blood sugar levels to fluctuate. If your elderly loved one is living with a serious medical condition and needs help managing the tasks of daily living, reach out to Home Care Assistance, an Oshkosh home care agency you can trust. Our caregivers are available 24/7, there are no hidden fees in our contracts, and we offer a 100% satisfaction guarantee on all of our in-home care services. Many diabetics worry that they cannot eat carbohydrates, but whole grains are healthy for people with diabetes. Whole grains like oats, quinoa, and barley can keep blood sugar levels at a steady number, and they also provide plenty of beneficial fiber. 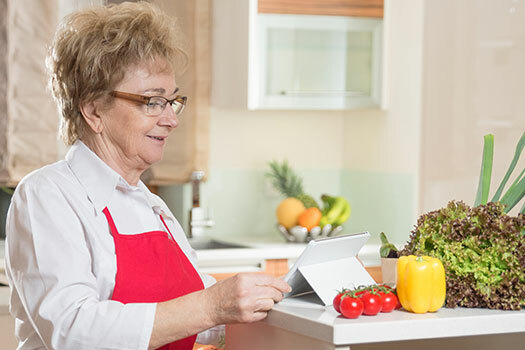 Seniors with diabetes who need assistance with meal planning and cooking can benefit from professional in-home care. If your aging loved one needs occasional help with bathing, grooming, cooking, or other basic household tasks, or if you need time to attend to important personal matters, reach out to Home Care Assistance, a leading provider of live-in and respite care. Oshkosh seniors can maintain their independence while living at home with the help of our reliable respite caregivers. To hire a professionally trained in-home care expert for your elderly loved one, call us at (920) 710-2273 today.